For You Good afternoon everyone, Wow!! A brand new launch from Tonic Studios with the stunning Dimensional detailed bags I have to say this bag is stunning and so easy to put together the die really does do all the work for you ,all I will say is that if you really want this die don't hang around as the stock is flying and I am not surprised. 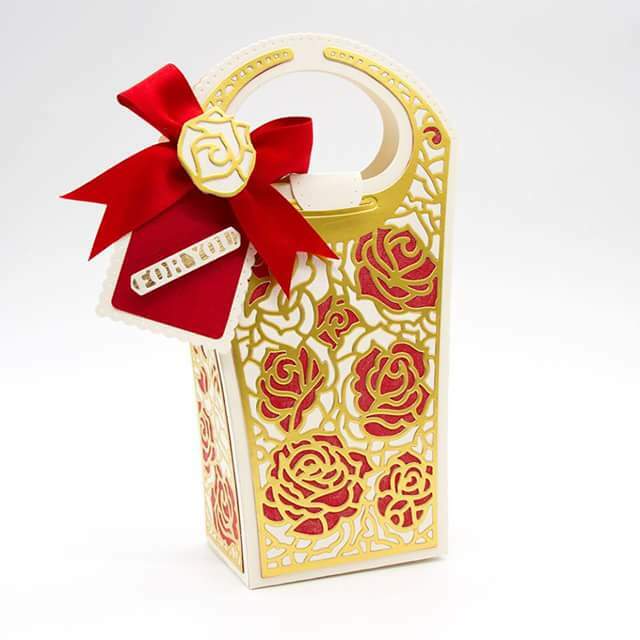 The bag base is made with a heavier weight card stock about 240gsm the gold detail was die cut out of craft perfect golden Satin card sock then the plain layer of ivory underneath is placed but not glued over the top and with a Red Nuvo Alcohol pen colour in the roses in the design and then go over the top with Aqua flow glimmer pen it doesn't matter if you go over the golden layer as you can use this as a template and then cut yourself another detailed panel in gold but I didn't need to do that as the spaces to colour are not to small once all the panels are coloured glue them in place on your box before you glue the base together its easier to assemble flat don't forget that all the detail to the sides are decorated the same way .once the bag is made up you will need to die cut a decorative tag in cream and red and add the sentiment for you in gold and cream card stock add a matching bow with a rose cut from the detail die in gold and cream what a perfect gift to give to anyone for any occassion.